Quintessential New Hampshire. The weather is not cooperating, we are nine days into Spring and it still looks like January. So what do residents do? Get together at the local playhouse and make fun of themselves. With some snarky remarks about folks in bordering states. For my readers who might be unfamiliar, frost heaves are what happens when roads built on poor foundations freeze and thaw and freeze repeatedly. They occur in the Spring and actually do subside as the earth warms. The scars are never totally healed and some heaves or corresponding potholes need serious repair. A huge fight always insures as to whether the town or the state will finance the fixing. Regardless, the patches never hold up through another season of heaving and collapsing, eventually necessitating total repaving of the thoroughfare. We have a small but exceptional playhouse in Peterborough. 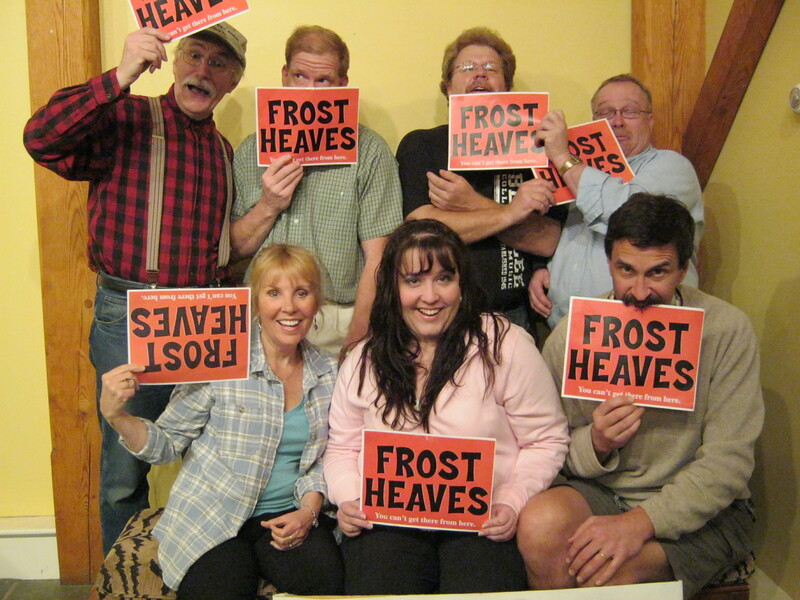 A local comedy group, Ken Sheldon’s Frost Heaves, gave a matinée of their last show of the season on Saturday. The Peterborough Players is where Tom Rush performed last year. I forget how much I enjoy going there. Help us write tonight’s Song on the Spot. The topic is “Cars.” Tell us about a beloved car,lemon, first car, worst car, or automotive adventure. Ready? Start your engines! I’m guessing, by the apparent response, most people filled it out and handed it in. I don’t do audience participation. Now, before you get all upset and begin to debate me? I totally understand those who do. I respect a crowd who wants to join in. I, personally, was traumatized in the ’80s by an EST group experience, which remains fodder for a different blog. Sufficient/concise to say, I don’t do group participation. I don’t sing along. I clap politely at the appropriate times but not along with the crowd. It just isn’t me. I loved the music. The tribute to the Everly Brothers was really well done. This was an odd troupe; four players and The Speed Bumps the backup band, which consisting of three totally unlikely characters hammering out tunes that I hadn’t thought of for years and love. If I were the sing-along type, this would have been the place. Comedy routines, all read from thick pages bound with an old-fashioned silver ring in the upper left-hand corner, were snappy and well played. Watching the, (OK forgive me guys! ), aging band members hammer out early Beatles tunes so well that if you closed your eyes? Not the Beatles, but damn good. As to the raffle? The first item was a CD of Ken Sheldon aka Fred Marple’s silly songs. Clean enough for the children and amusing the first time through for adults. A coffee mug with the Frost Heaves logo, and a reclaimed stainless steel cream and sugar set from the local “Recycling Center” rounded out the prize list. The impromptu song was about a Fiat. I was impressed anyone could come up with something funny and cohesive in 15 minutes. It was a fun show. This entry was posted in creativity. Tagged Comedy, Fred Marple, Ken Sheldon, Kens Sheldon's Frost Heaves, New Hampshire, Peterborough NH, The Peterborough Players. That sounds like such fun!!! I’ve never been to the playhouse despite that it is less than 3 miles from my house. I’ll definitely have to look into going soon! Next time we’ll go together! Sounds like a fun time. I love the Everly Brothers and the Beatles. Cathy’s Clown was, apparently number 1 in the charts on the day I was born. They played Cathy’s Clown! Wish I’d known it is your birthday song! It sounds like a good time but I’m with you on the audience participation. I don’t do well in that area either.